Since its inception in 1990 the Sangam has organized and curated its own Performing Arts Festival. 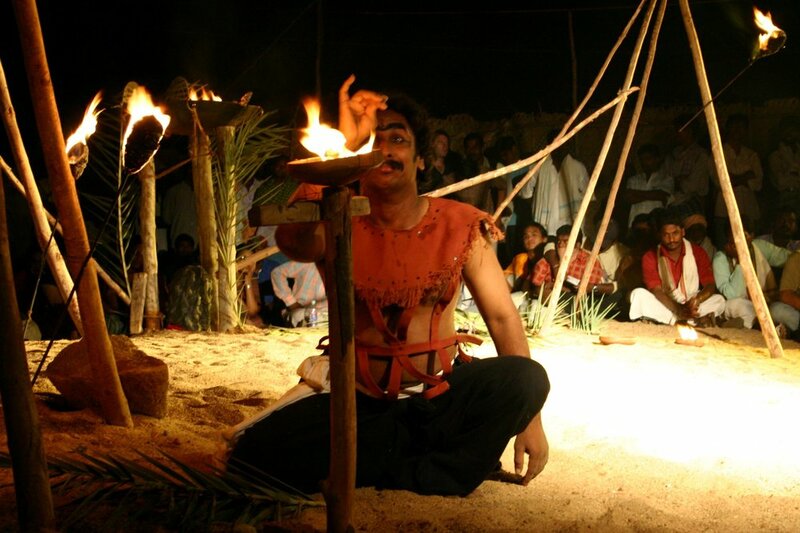 Kattaikkuttu performances are at the core of this unique rural cultural event. However, the program always features other theatrical, musical and dance performances that cut across the cultural and social boundaries that divide India’s rich traditional, classical, folk and contemporary performance arena. All Festival performances are free and accessible to rural, urban and international spectators. Through its programming the Festival allows rural spectators to witness other performance genres that normally would be out of bounds for them. Similarly it allows urban theatre enthusiasts, research scholars and international guests to experience the vibrancy and richness of Kattaikkuttu. And equally important, it allows performers of different genres to see each other’s performances and establish novel contacts between forms back stage.